Perhaps people are finally getting sick of warm beer. Pubs in Britain are closing at a rapid rate -- up to 29 each week by some counts -- as people drink less and stay in more. Changing lifestyle habits have hurt the £18 billion ($28 billion) pub industry, which faces rising overhead and growing competitive threats. London's red-hot property market has driven some publicans out of business as developers offer big bucks for their land. About 29 pubs closed every week across Britain in the year ending June 2015, according to the U.K consumer group Campaign for Real Ale. 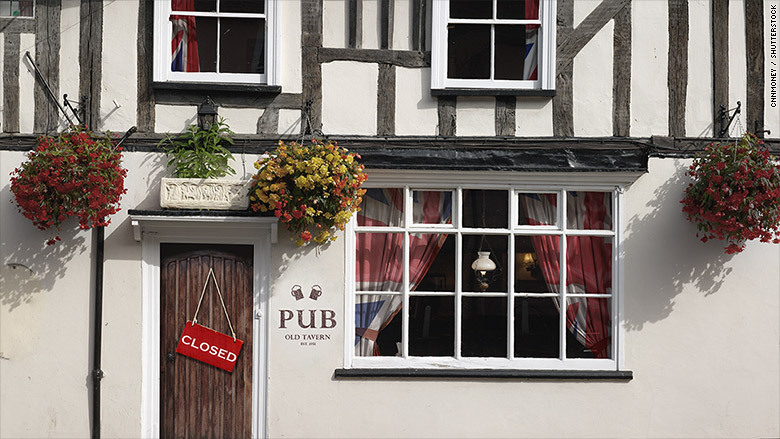 The latest numbers from another industry body, the British Beer and Pub Association, put the closure rate at 13 a week, but those figures don't factor in the country's sizeable independent pub sector. British pubs are closing down in huge numbers as people drink less and competition from other alternatives intensifies. Either way, drinkers are vanishing. Pubs in Britain have been shutting their doors in high numbers for years, as big disruptions like the recession and a ban on smoking in 2007 dealt heavy blows. The industry recovered somewhat from those shocks but the underlying trend of people boozing less hasn't shifted. "The pub hasn't kept pace with social change," said British author Pete Brown, who has written numerous books on beer, pubs and drinking culture. Once the heart of the local community -- where people gathered not just to drink but to meet, be entertained and keep warm -- pubs in the U.K. now face stiff competition. Technology keeps some would-be drinkers occupied at home, while growing health awareness has prompted adults to cut down on alcohol. Consumption has fallen by 18% in a decade, according to the BBPA. 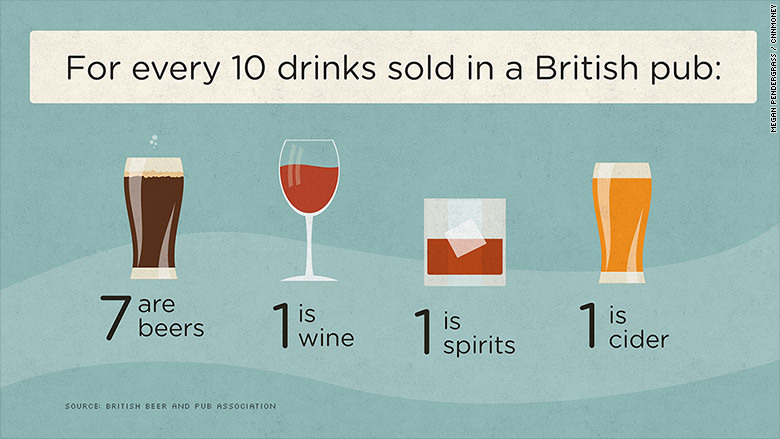 And about one in five adults in the country don't drink at all. 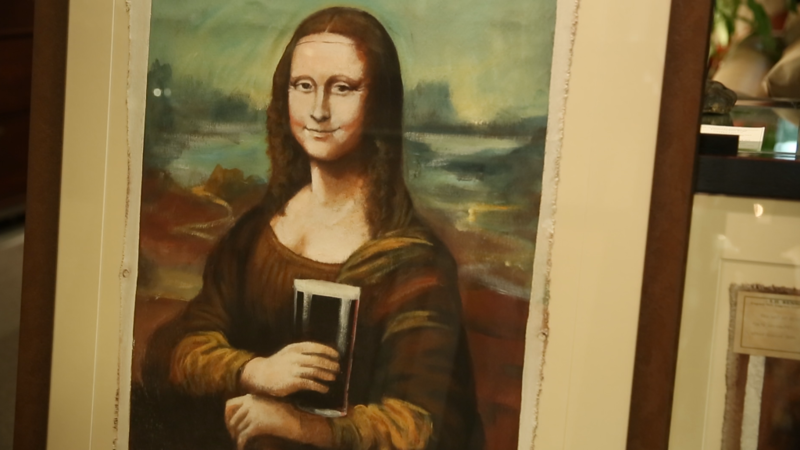 Beer author Pete Brown said the tough environment demands a new kind of publican -- a savvy entrepreneur -- who can compete with rivals in the marketplace by offering something extra. Just shining the taps and opening the doors isn't enough. "You have to have something over and above, whether it's a brilliant live music night or the best beer range," Brown said. In fact, specialist beer is one bright spot in Britain's drinking landscape. Craft breweries are booming and global drink giants have been buying up hot, young brands. Beer sales in the U.K. ticked up for the first time in nearly a decade last year. It's a curious development at a time when pubs are declining so rapidly. Brown said people are "drinking less but better." "Decrepit old pubs have become craft beer pubs and destinations, rather than the old local that you pop into because you haven't got anything better to do," he said. British pubs are still a valuable economic contributor and tourist draw. The industry supports almost 900,000 jobs, close to half of which are held by young workers. BBPA spokesman Neil Williams said cuts in beer tax and business rates are crucial to secure the future of the pub. And then it's up to consumers. Williams warns Brits to use their local pub or be prepared to say goodbye. "That is the key to ensuring their long term viability," he said. "If we don't do that we will lose them."